Colorado FriendShip's sponsors help us keep costs down and expand our programs. Please encourage your company or organization to sponsor us with donations of high-quality food and clothing and with financial contributions. Our sponsors provide top quality food and clothing, financial and other support. 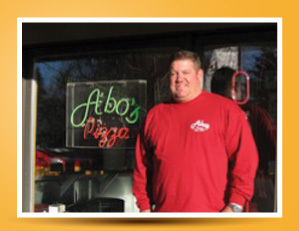 Abo’s Pizza has been a Colorado FriendShip community partner for many years, thanks to "Big Tom" Smathers, who owns Abos Pizza in Niwot and Longmont. With Tom's help, we receive hundreds of pizzas each year from Abo's Pizza stores in Colorado, a big hit with those we serve in our Hot Meals on the Street program. For information about volunteering, tax-deductible giving, or introducing Colorado FriendShip to your business, company or organization, please contact us.